We often get asked how our Push Intelligence for Tableau solution is different from the Tableau 8 Subscriptions feature. Tableau 8 Subscriptions provides a way for users to access reports or worksheets that are important to them, through email notifications. An image of that report or worksheet is emailed to them every day at a designated time. If the user discovers information in the email that is interesting to them, with one click, they can go directly to the Tableau interactive dashboard to investigate further. Users can receive alerts and notifications when data changes critically or passes a certain threshold. 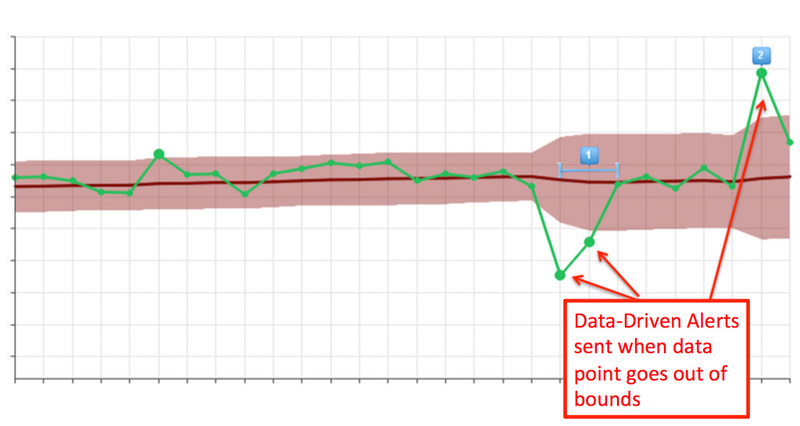 The following image shows an example of receiving alerts when the data has changed more than two standard deviations from the moving average. Other thresholds based on stoplight criteria, moving targets as well as others. This feature triggers a new email notification once new data is available for a Tableau dashboard. Users only receive workbooks when the data has changed or been updated, as opposed to having the workbook delivered at a pre-set time every day. Users can be automatically notified when a specific metric in a Tableau workbook has changed in a way that requires attention. The metric can be sourced from any part of a workbook, including from metrics in underlying dropdown and pick-list selections. A single workbook might have dozens of metrics. 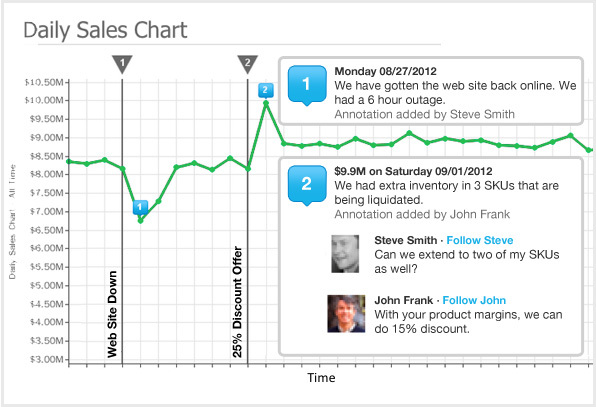 Different users could be alerted by different metrics in the same workbook based on interest. For example, for a sales dashboard that has a drop-down option for each territory, each territory manager could be alerted for significant changes in sales in their own territory. Tableau 8 requires each user to subscribe proactively to every report or worksheet. 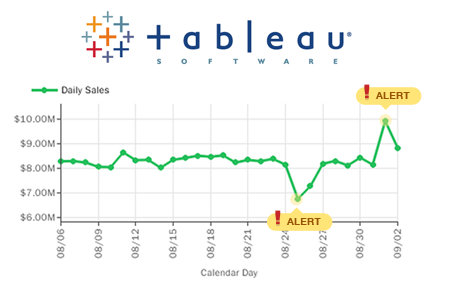 Our Push Intelligence for Tableau solution allows an admin to set up email report bursting and data-driven alerts for individuals or groups in the company. With no action required on their part, users will just start receiving email alerts and notifications that will pull them into their Tableau dashboards. The following is an example of the admin controls in the Metric Insights platform. An admin can assign group-level metrics to individuals or create customized lists of metrics for individuals. This feature enables users to have discussions around significant data points and have those discussions memorialized with the relevant data. Further, users can be alerted when such discussions happen, so they can take action if necessary. The following is an example of comments and events in the Push Intelligence for Tableau solution. The end result of implementing these features is that Metric Insights can both increase engagement and usage of Tableau in an organization and also focus users’ time on analysis that is most important to the business. The savvy admin can set up personalized alerts for the less active users on an individual or group basis. These users then automatically start receiving email alerts about the dashboard and workbooks that are important to them when the data changes critically or passes key thresholds. Personalized email alerts can save users time by providing a launching point straight to the relevant Tableau dashboards and workbooks that are significant at that time, allowing them to perform deeper analysis and gain more insights. See our Push Intelligence for Tableau page for more information.